It’s easy to put off exercise and reason that life is too busy to get fit. But the truth is – it’s not. Exercise can easily be incorporated into your life; all it requires is a change of mentality. I’m not a trained fitness professional but fitness and health have always been of core importance to me and as the weather warms, I’m enthused by the This Girl Can campaign and the attraction of sporting events around the country. 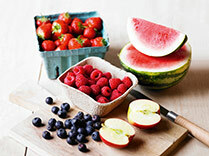 Lifestyle changes can make a huge difference to body, mind and soul. Take walking – by this I mean brisk, vigorous walking. It could be as simple as planning a regular daily route, using lunchtime to stretch your legs or signing up for an organised walk. Walking gives you time to yourself and to really feel the health benefits, regular power walks at a moderate-to-high intensity will give you those wonderful endorphins – invaluable to staying positive and crunching calories. These exercises will ensure your posture is correct so that you tone up and maximise your workout. Slightly contracted abdominals help support the spine and stabilise the pelvis – plus, you’ll be honing a flat tummy to boot! Tense your abdominal muscles by about 80% – try pulling in your bellybutton – enough to walk tall but not feel uncomfortable. 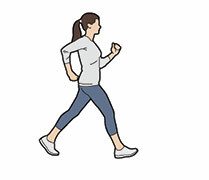 Work your muscles as you walk by hitting the ground with your heel before rolling through to your little then big toe. 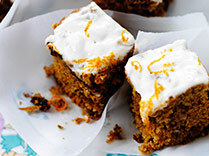 This activates your glutes. 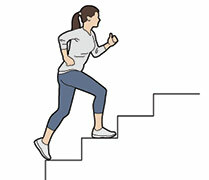 Go one better by walking uphill or up steps to create a resistance that really works all the leg muscles. It’s tempting to ignore your arms but the upper body limbs play a key role in fast walking. For maximum speed, bend your elbows at 90 degrees and drive your arms back and forth at pace. 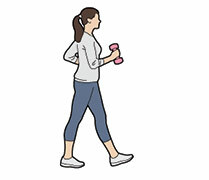 Walking with wrist weights or light dumbbells will help build power, too. Whatever your goal, be it athletic performance, weight loss, wellbeing or muscle definition, set yourself a realistic plan. Losing half a stone or dropping a dress size in 10 weeks is achievable, and having a goal will keep you motivated when the going gets tough and give you a focus point to your exercise. Getting fit doesn’t have to mean battling away at the gym each day – your personal goals need to work with you and your lifestyle. According to exercise guidelines, keeping fit means doing moderate-intense cardio for at least 2.5 hours per week. But it’s not just about getting your heart and lungs working or being obsessive about calories – strengthening and shaping your muscles (think toned biceps and triceps for summer dresses) is a vital part of feeling good and looking great. For extra motivation, log your fitness plan in a diary to see your progress and keep it as a memento of your achievement. Start in a plank position on your forearms with core engaged. Step each arm into a high plank, weight on your hands. Reverse the move and repeat 10 times. 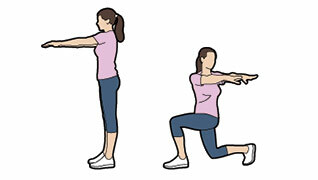 Start in reverse all-fours with feet flat, hands under shoulders, arms extended. Bend your arms to lower yourself, then push through your hands to straighten your arms. Repeat 10 times. Assume a press-up position, knees and hands on the floor, with your hands in a diamond shape. Engage your core and perform a push-up. Repeat 10 times. 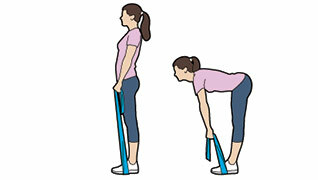 Stand on a resistance band, feet hip-width apart with a handle in each hand. 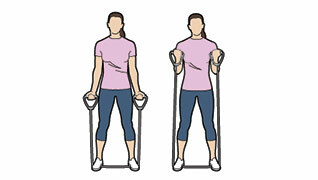 Keep your elbows close to your body as you curl the band towards your chest, then slowly lower. Do 10 reps. So, how often should you exercise? Guidelines suggest 30-60 minutes of moderate intensity cardio work (gentle swimming, cycling, power walking) five times a week. Or 20-60 minutes of vigorous intensity cardio (running, playing tennis) three times a week. A 30-minute walk or cycle commute counts as one of your five a week. To build strength, try to include two to three full-body weights sessions to give you shape and definition. If used the right way, weights won’t bulk you out and having more muscle burns more calories, so combating fat. But don’t just work the front of the body – strengthening your back will help prevent longer term problems. Do the below routine with a resistance band to work the posterior muscles and help banish back pain, improve posture and sculpt a defined back. Stand on a band, feet hip-width apart and an end in each hand. The band should be taunt. Hinge forwards, keeping back and legs straight until your chest is almost parallel to the floor. Rise up to standing and repeat. 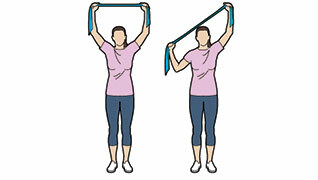 Hold a resistance band taut overhead. Bend your right elbow to lower the hand to shoulder level, then extend the arm back to the start. Complete a set then switch sides. Sit on the floor, legs straight out. 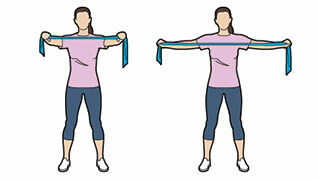 Loop a resistance band around your feet and hold each end with extended arms. The band should be taut. ‘Row’ backward, bringing hands to ribs. Extend arms back to the start. Repeat. Stand with feet shoulder-width apart. Grip the mid-section of the band, arms in front at shoulder level, palms facing down. Squeeze your shoulder blades as you draw your arms apart. Slowly return and repeat. Do you like playing tennis? Perhaps you enjoy cycling or orienteering, running around in the garden with the kids, or just jumping freely on a trampoline to bring out your inner youth. If you’re looking for some form of cardiovascular exercise to increase your aerobic fitness, it’s vital to find something you enjoy as you’re more likely to continue with it long term. Any physical activity will bring out those happy endorphins, the feel-good chemicals, which will help you approach life’s daily stresses and strains with positive energy. A good aim is to do an activity for at least 30 minutes at an easy pace before increasing the intensity. Fresh air, scenery and nature can all add to that feel-good factor, so exercising outdoors will invigorate the soul and flush the cheeks for a healthy glow. Check whether your local park has an outdoor gym, and make the most of your natural resources and surroundings, such as a local footpath or trail route. You could even do my push-up routine using just a park bench! 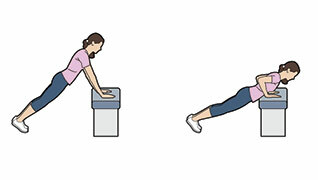 Start in a high plank position with your wrists under your shoulders and feet together. Lower your upper body towards the floor, keeping your upper body in a straight line. Use your arms to press back up when your chest is near to the floor. Too hard? Try a wide-feet push-up. 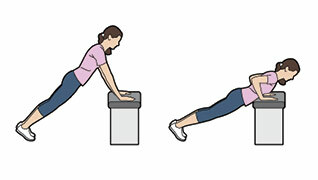 Start in a push-up position (wrists under shoulders; body in a straight line) and take your feet out wide to the sides. Lower your body to the floor. Pause when your chest nearly touches the ground and push back to the start. Gradually, bring your feet closer together until you can perform a full push-up. 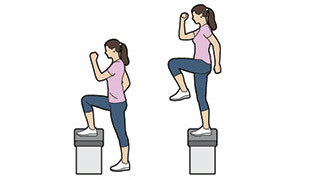 Place your hands on a raised platform and extend your legs behind you. Lower your body until your chest nearly touches the platform, keeping your torso straight. Push back up to the start and repeat. Crouch facing away from a platform and place your hands shoulder-width apart. Put one foot at a time on the platform until legs are extended. Engage your abs and push your body off the floor. Lower chest to the floor and repeat. To do any form of exercise efficiently, you need to be able to activate your core. A strong core is required for sports performance and for good weight training technique. I’d recommend trying Pilates or another core class, like Les Mills’ CXWORX class, to learn about the core muscles and how to engage them. Once you’ve picked up the basic techniques, including working your front and side abs, lower back muscles and hip muscles, you can use a reputable online video to get both inspiration and new exercises. Core work is great for working on posture and also helps to strengthen important tissue, which will have a positive effect on all the other activities. It will dramatically improve your balance and effectiveness for sports such as running, tennis, golf and swimming. The reason why most sports professionals practise Pilates and concentrate on core exercises is to maintain their efficiency. Focus on your abs and waist and try to incorporate these short exercises (complete 15-20 reps of each exercise, three times round) into your full-body workout regime. Lie face-up on the floor with your knees and hips bent at 90-degrees and arms by your sides. Engage your lower tummy muscles to lift your hips off the ground. Keep your shoulders on the floor. Pause and slowly lower heels back to the start. Lie on your back with legs extended and arms straight by your sides. In one movement, lift your torso and legs up to bring your body into a ‘V’ shape. Pause and then lower back to the start - don’t let your toes touch the ground. Repeat 10 times. Start in a side plank with your left arm on the floor, elbow under shoulder and feet stacked. Place your right fingertips behind your head. Tighten your abs and draw your right leg towards your left arm. Repeat 10 times and then switch sides. Great for burning fat and boosting fitness, high intensity exercise is a short but intense workout that does wonders for your body shape, particularly if you’re after fast results. The aim is to boost your VO2 max – increase the amount of oxygen your body can use per minute. Put simply, the greater your VO2 max, the fitter you are. Once you can perform a cardiovascular activity like running, cycling, swimming or power walking at a moderate intensity for 30 minutes, try a high intensity workout. There are plenty of regimes to choose from – such as HIIT – that fuse high-energy intervals with short rest periods. Simple fartlek, or ‘speed play’, involves training at various speeds, alternating between slow and fast paces. This sort of workout is perfect if you don’t want to spend hours in the gym but want to up your fitness levels. Working harder will increase your metabolic rate, not only during exercise but for a few hours after too. 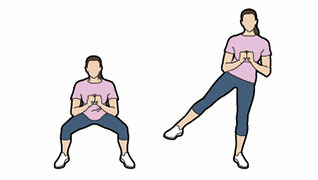 From a standing position, feet hip-width apart, drop into a squat. Pressing through the heels, jump into the air as high as you can. Land softly back in a squat position and repeat. Take a big step to the left, lunging down, swinging right leg behind left. Push through your left leg to jump explosively and land on your right leg. Repeat. An all-in-one move. Squat down, hands on the floor. Kick your feet back to a plank. Jump your feet back to your hands then jump up explosively. Squat back down. Repeat. 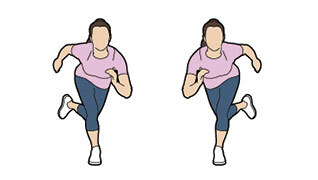 Lunge forward with your left leg, knee remaining above the ankle, back knee towards the floor. Jump into the air, switch legs and land in the lunge position with your right leg in front. Stretching and low-intensity flexibility exercises are a crucial part of any fitness routine, along with strength, balance and endurance work. 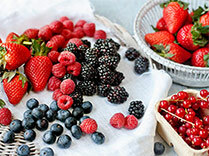 Mix and match these elements into your weekly regime for overall health. Flexibility helps boost muscular recovery, aligns the body, eases pain and relaxes your whole being by giving you a greater range of movement. Make time for yoga or Pilates – the controlled positions and static poses combined with deep breathing help boost blood flow (and therefore oxygen) to the brain – this clears the mind and relaxes you. It’s also very energising, despite not being an exertive form of physical exercise – great for those who spend most of the day sitting at a desk. For a less static and higher energy form of traditional yoga, try dynamic or flow yoga, which is a more fluid version of the activity. It involves a sequence of poses that flow, enhancing flexibility and full-body strength. Begin in a plank position with your weight on your forearms. Press your hips and shoulders back toward your feet, lifting your bottom into the air and upper arms extended. Pause and drive back into the plank position. Repeat 10-15 times. push back up to the start. in front of the chest. Raise the arms up to increase the stretch. Pause for 45-60 seconds. The body moves in three planes – the sagittal, frontal and transverse. Most daily actions, such as walking or eating, take place in the sagittal plane – in other words using forward and backward motions. To engage muscles from different angles and improve your overall range of mobility, and also to prevent injuries and acquire better body stability, it’s important to exercise in different planes, particularly in the lateral. I’ve included moves this week that are perfect to add to your strength workout, and the three-dimensional routine will help to balance the shape of your body to create a soft, feminine sculpted look. Similarly, adding this variety into your strengthening programme will boost your athleticism by incorporating twisting, side, bending and rotation movements. Stand with feet shoulder-width apart, and shift your hips back into a squat. Rise up and lift left leg out to side, squeezing your glutes. Lower the leg, squat and repeat with right leg. From a standing position, raise your arms to shoulder level and extend in front. Step into a lunge and twist torso left. Return to start, and repeat to the right. Tie a resistance band around both legs just below the knee with feet beyond hip-width apart. Keeping the band taut, move sideways to the left by leading with one leg. Repeat, this time moving to the right. Lie on your left with hips stacked and legs extended. Bend right knee to a right angle and support your body with the left upper arm. Flex left foot and lift leg as high into the air as you can. Roll over and repeat. high intensity workout that has left you sore and aching – a sign you’ve worked hard! Active recovery (very low intensity exercise that boosts blood flow and aids recovery) for example, in walking, gentle swimming, foam rolling or body massage, will help to remove waste products like blood lactate from the muscles, can take place on these days. To get the most out of any workout, you need to let your body, muscles and tissues rest and actively give them a chance to stretch out. There are many tools you can find to help loosen your muscles, but by far the best one out there for me is the foam roller – particularly good after long runs. 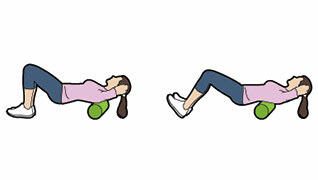 Lie on your side with a foam roller under your hip. With hands on the floor, use them to roll your body back and forth 10 times, from just below the hip to just above the knee. Repeat on the other side. Lay back on a foam roller placed under your shoulder blades and support your neck with hands behind ears. Knees bent, lift your hips into the air. Slowly move the roller up and down the upper back region. Avoid rolling over your lower back. 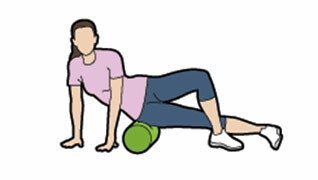 Sit on the foam roller with your left ankle on the right thigh. Shift your weight to the left, with the roller underneath. Roll back and forth 10 times, pausing on tight spots. Repeat on the right. Stand with a mini roller or massage ball under the arch of your foot and roll the foot forward and backwards, from heel to forefoot. Roll the sole of both feet 10 times. Week 10 – well done on finishing! So, what comes next? so results and motivation might dwindle after a period of time. I always find it helpful to change my workout – use the cross trainer instead of running, lift heavier weights, try a new class – every 4-8 weeks. It will help keep you out of an exercise rut and give you a balanced physique. Alternatively, gather a group of friends and learn a new activity. It’s quite fun to combine a new regime with learning new skills and improving your coordination. For example, I tried climbing recently at my local climbing centre; it was inexpensive and really helped build my upper strength and agility. Similarly, if you haven’t tried boxing, give it a go – time flies and you get a great full body work out. Other sports to try are outdoor bootcamps like British Military Fitness, or indoor spinning and body resistance exercises such as TRX. 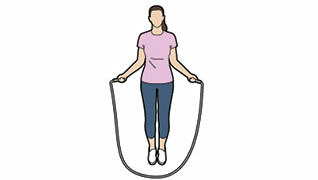 With handles in each hand, keep your elbows as close to your sides as you swing the skipping rope over your head. Try small, quick jumps and skip continuously for 60 seconds. Place your hands on a bench, legs extended behind. Lower your body until your chest nearly touches the bench, keeping torso straight. Push back up and repeat 12-15 times. With your right foot on a park bench, push through the heel to raise the left leg, driving the left knee up to hip height. Step off the bench and repeat 20 times on the same leg, then switch legs for another 20 reps. Sit on the edge of a bench, palms either side of hips. Shift your hips off the bench, bend your elbows to 90 degrees and lower your hips. Straighten your arms, then repeat 12-15 times.